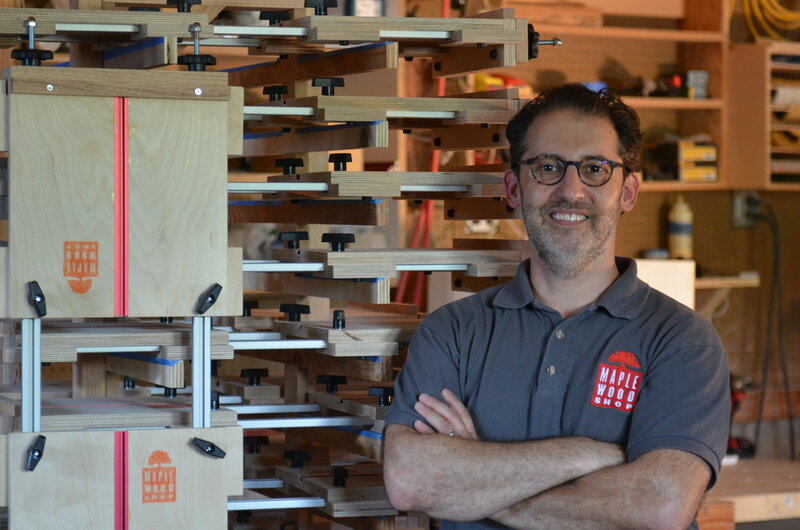 Mike Schloff founded Maplewoodshop in 2016 to help children develop life skills such as creativity, grit, teamwork, and problem solving by doing woodworking with hand tools. Mike has been woodworking for 15 years since he moved into his home and needed to tackle repairs. He invented the workstation that Maplewoodshop uses after building several generations of woodworking tables and fixtures for teaching children and adults. He is a lifelong tinkerer and still teaches locally to try out new lesson plans. Prior to Maplewoodshop, Mike was a pioneer in the Internet space, helping people and companies take advantage of this new medium since 1995. In his spare time, Mike likes to work with local wind fall trees making tables, benches, and all sorts of creations that let the natural grain and forms determine the design of the finished project. Lindsay is an art teacher of fifteen years. Her career began at a public school in her home state of Alabama where she established the school's first art program. Her professional pursuits brought her to New York City for graduate studies at Teachers College at Columbia University where she earned her M.A. and Ed. M. in Art and Art Education. Lindsay continued her career at Columbia by joining the faculty at The School where she developed a child-centered and interdisciplinary visual art curriculum for elementary and middle school students. Lindsay’s passion for woodworking began as a young child helping her father in the family’s basement workshop. She enjoys exploring the parks, playgrounds, and museums with her husband and three year old son. Craig joined Maplewoodshop in 2018 after graduating from the University of Wisconsin-Madison. He brings a wide range of experiences to the team from being a camp counselor to fundraising to public affairs. Although, his high school didn’t offer shop classes, he has been working with his hands most of his life. Craig has been working for his mother’s landscape design business for 10 years and learned woodworking from his father in their home workshop. Craig was drawn to Maplewoodshop by the opportunity to help introduce kids to woodworking, because he recognizes how lucky he was to learn woodworking at home. He is also a member of the NJWWA. Cheryl joined Maplewoodshop in 2018 after over 30 years of teaching woodworking in a local middle school. Having grown up in a very hands-on family, it seemed natural to get a Bachelors degree in Industrial Technology and a Masters degree in Communication Arts. Not ready to lay down her hammer after retirement, Cheryl became acquainted with Mike and his program and was drawn to the idea of being a part of this movement to bring woodshop back into schools, camps, and afterschool events. She brings decades of experience working with children to the table and has a passion for having present and future generations experience the joy of creating something with their own two hands! Emily officially joined the Maplewoodshop team in 2018. As a public librarian working with kids and teens, she was trained by Mike to teach Maplewoodshop programs at the library, and continued to work with the organization in other capacities until joining on us the Customer Success Specialist. She grew up in a very hands-on household where the only cure for boredom was making something, which makes Maplewoodshop a perfect fit. Emily has a passion for providing today's kids with the same opportunities she had growing up: to learn how to make things with their own hands. Amy is excited to combine her passion for marketing with her love of crafts and woodworking. Over the course of her career, she has helped big and small brands, like Mr. Clean and Advil Cold & Sinus, to amplify their marketing message. Amy is delighted to put her skills and passion to good use by helping more kids learn about grit, teamwork and determination through woodworking. When she’s not at work, she loves to spend time with her husband, Tim, and three beautiful daughters, and upcycle discarded furniture into newfound treasures.